Sharp FP-A40CW (FPA40CW), Sharp FP-A40UW (FPA40UW) HEPA and Carbon Filter Replacement. Sharp FPA40CW / FPA40UW Filters There is 1 product. Sharp FZA40SFU (FZ-A40SFU) is Original Sharp Filter. 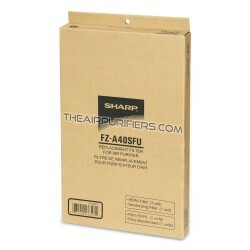 Sharp FZA40SFU (FZ-A40SFU) contains HEPA and Carbon filters for Sharp FPA40CW (FP-A40CW), Sharp FPA40UW (FP-A40UW).